When a disaster hits, response is needed immediately. Ameri-Force recruiters provide immediate access to highly-skilled specialists in areas such as: demolition, water & fire restoration, mold remediation, hazardous materials management, Hazmat & Hazwoper, industrial cleaning and hydro-blasting, and much more. All candidates have been screened and evaluated to ensure they have the proper skillset to handle your environmental recovery efforts. 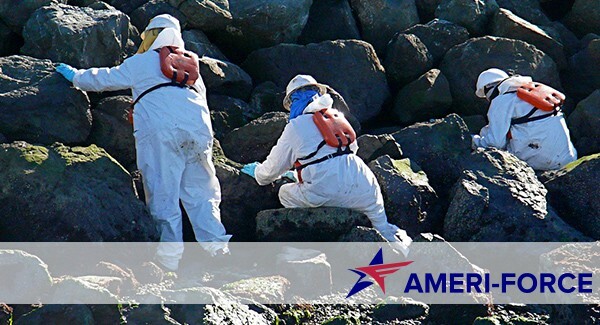 Ameri-Force is able to fulfill temporary, part-time and full-time environmental recovery staffing needs. We place environmental recovery specialists throughout the United States and have a large database of readily available professionals. Clean-up includes natural disasters such as large storms and hurricanes as well as man-made disasters & accidents. When the 2010 Deepwater Horizon disaster discharged an estimated 4.9 million barrels of oil into the Gulf of Mexico many of the disaster relief efforts were powered by Ameri-Force. Our specialists were able to assist in shoreline and water cleanup, working around-the-clock to recover from this environmental disaster as quickly as possible.